Just give me the stats: In summary my campaign got 20 clicks from 23,473 impressions, which is a CTR of 0.085 %, a CPC $2.47 and total spend of $49.43. I was targeting senior executives in tech companies in Boston / Cambridge. A few weeks ago I was given a $50 voucher from LinkedIn to try their ad system. With the voucher you have to pay an activation fee of $5 from a credit card, but once you’ve done that it’s easy to get going. I wanted to see if the ads could get me an interview or a contact in Boston at the companies I was targeting. There are four main ways to target views of your ad. Audience Expansion : to show your ads to similar people you are targeting in the first 3 options, but are slightly different. Once you choose your target audience you’ll be able to see roughly about how many people could see your advert. In my case I was targeting 2,624 individuals. Designing your ad is straight forward. You have the option to enter a URL, headline & description. 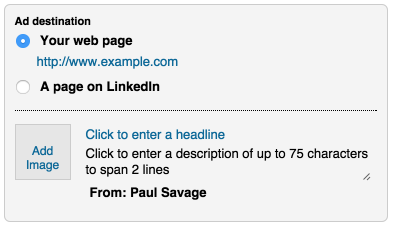 There is also a placeholder for an image, which LinkedIn highly recommends you use. I opted to use my own URL that I use for my LinkedIn profile, but if I was to do it again I would consider doing an A/B test on this. It’s likely that people are using LinkedIn for a specific purpose, and taking them off-platform would be a higher pain for users and thus make them less likely to click. Per campaign you can add 15 variations of your advert. Ads variations that worked best for me were ones that had a clear call to action asking the viewer to do something. Ads that get a higher click as the campaign goes on can be shown more often via a setting. Impressions over the weekend are about 1/10th of the level during the week. I was surprised that the fall off was so high. I didn’t get any clicks on Saturday / Sunday and it’s difficult to say if it’s due to the fact that there was a lower inventory of impressions, or if people browser LinkedIn differently at the weekends. 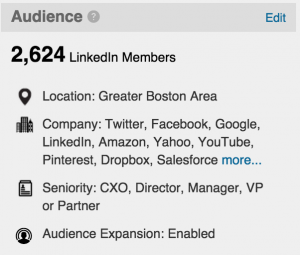 If you are running ads that are time sensitive, LinkedIn can take 4-6 hours to approve ads. So do plan in advance! 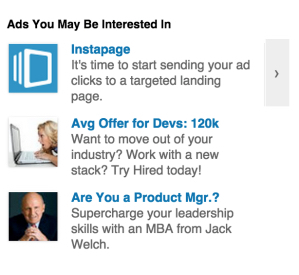 I was surprised at the relatively high cost of the ads on LinkedIn which meant that $50 didn’t go so far. Perhaps if you had a recruitment budget of a few 100 it could be a way of highlighting your job positions. Having only 20 clicks really isn’t enough data to say if my campaign was a flop or not, as the number isn’t statistically significant. If you’d like to learn more about marketing on LinkedIn you should download their Sophisticated Marketer’s Guide to LinkedIn. P.S. Thanks to @pistachio for some tips on the ad copy !